Your property taxes will be aggressively appealed in 2018 / 2019, and every year by the #1 property tax firm in the country. If your taxes are not reduced you PAY NOTHING, and a portion of the tax savings is the only fee you pay when your taxes are reduced! Many FREE benefits come with enrollment. Your deadline to protest this year was MAY 15th. Enroll today to ensure you never miss another protest deadline! It’s YOUR RIGHT to appeal your property taxes each year. It’s also YOUR MONEY that the County keeps when you overpay. Not anymore! Enrollment in the RISK-FREE program means your family is protected for as long as you own your home. 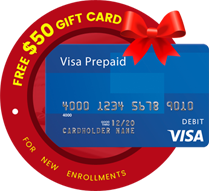 Disclaimer: You will receive a FREE pre-paid Visa gift card as a BONUS ENROLLMENT GIFT to welcome you in the program! This will be mailed to your address once your 3 easy enrollment forms have been received. This Offer cannot be combined with any other offer and only available to new O’Connor property tax clients. New clients have not used O’Connor property tax services in the last 3 years.